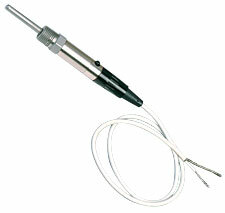 This sensor is desighed to be used in immersion applications where it will be mounted into a process or pressure vessel using a 1/8NPT threaded port. The integral connector and supplied mating connector with cable allow for continuous monitoring of the sensor, or allows for removal of the connector and cable for only periodic monitoring. 참고: For additional cable length, add required length (in inches) to the end of the Model Number and add $0.80/FT to the price.